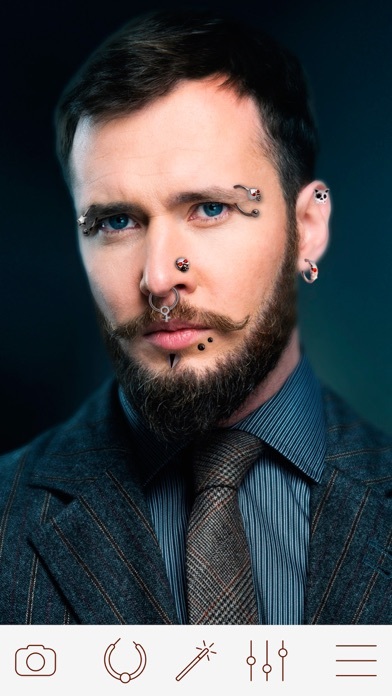 Piercing Camera lets you try different piercing styles without any pain! Piercing Camera is the best free alternative for popular applications such as PIP Camera Effects and Funny Photo Effects. You can choose different categories to choose different piercing objects: Face Rings Piercing Ear Rings Piercing Belly Rings Piercing Labrets Piercing Teat Rings Piercing Nose Studs Piercing Piercing Camera application contains more then 300+ different piercing objects available. Also you can adjust every photo aspect * Lot of customized magic mirror effects. * Brightness * Contrast * Saturation * Blur * Temperature * Shadows/Highlights * Crop * Focus Have fun and enjoy!